what I'm used to, and the need to pay continuous attention to the speakers, pretty much left me exhausted and the drive also had heavy traffic which was very tiring. So, enough of the talk from the soft, squishy and wet topics of physics' cousin, biology, even though it was quite interesting, and back to the hard sciences. Finally, the weather and sky opened up just a bit last night so I quickly set up camera and tripod before the clouds came back. 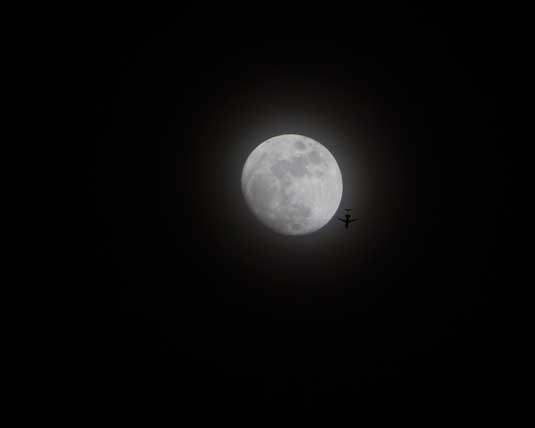 The first attached photo is of a near miss between airplane and moon. The planes, from LAX, often times pass at high altitude just right to cross the line of sight with the moon. Resident Astronomer just misses catching the "Plane in the Moon"
I was lucky several months back now to catch a great photo of the airplane fully in the moon, but this time the alignment was never quite right and I got only this one near miss. There was still a lot of moisture in the sky as evidenced by the glow around the moon. My Astrometry goal for the evening was to find an object, smaller than the Big Dipper, used last time. A large object like that covers a large area on the celestial sphere and trying to capture it and reproduce it on a flat camera plate is going to introduce errors and distortions I any detailed measurements. 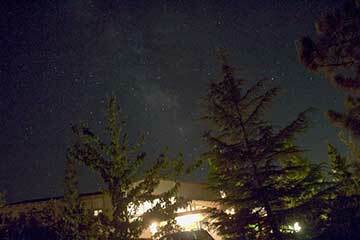 So, I picked on a smaller object like the Pleiades, but couldn't see it or even find it in the camera. I've found that the compass/level applications now the IPhone is a pretty good way to point the camera in the right sky direction. You should look at that app if you haven't already used it. Given the azimuth and altitude of the target the app makes adjusting the camera pointing angles pretty straightforward. But, I still couldn't find the Pleiades. The skies were just to bright and cloudy. So, I used bright Sirius as my test object neighborhood. See below. This time I used 100 mm focal length rather than the previously used 28 mm. This smaller area on the celestial sphere turned out to be a much more accurate test. The second attached photo shows Sirius with some surrounding stars. I used relatively bright stars, identified by R1 through R4, as reference star for AIP4WIN software to identify where my camera was pointed. Sirius is the bright star labeled R1. 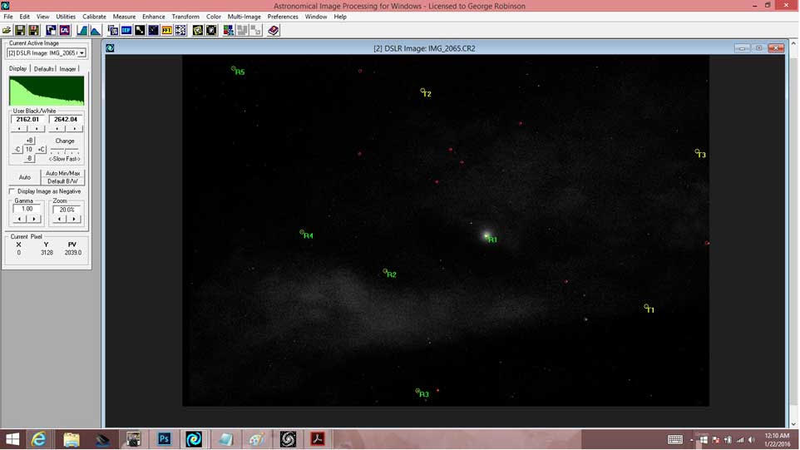 The software looks up in the star catalog and finds the exact position the camera is pointed and associated real astronomical positions with each pixel in the camera image. Then, I selected three arbitrary targets, T through T3, which were meant to be test cases to see if the software would correctly identify their respective right ascension and declination. Remember the whole purpose of this is to be a able to find the precise location of some unknown or new object like s comet or supernova or whatever and be able to tell other astronomers where to point their scopes to find the object. You can see that the sky was still quite bright with city lights and the clouds didn't help much either, but the software did its stuff. The results are plotted in the third attached image. 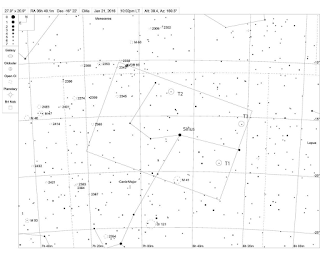 This star chart image shows the camera field of view as the large rectangle. The chart view was selected so that it displayed all stars with visible magnitudes as dim as m=6. The positions identified for the three targets, T1 through T3, are shown as three little circles, with each center as the predicted position. 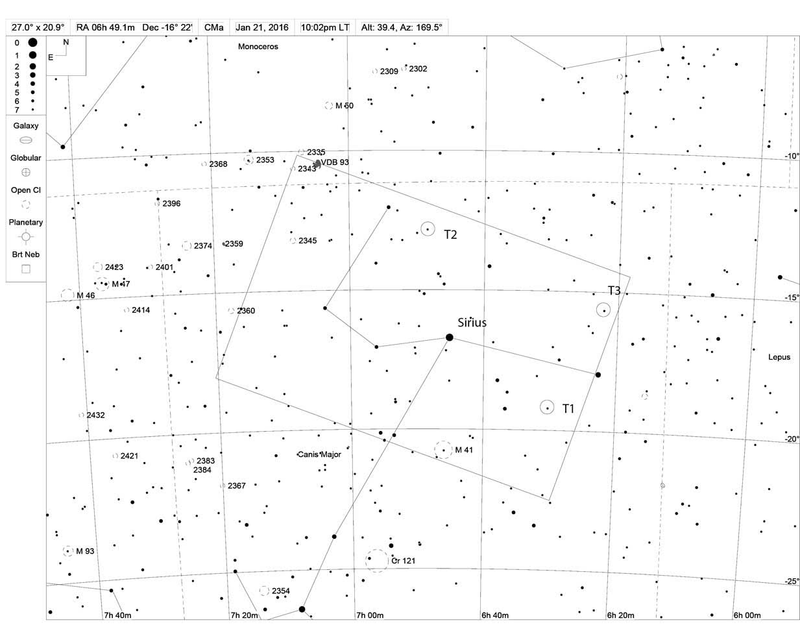 Now, surprise of all surprises, there is indeed a little star, indicated by the little point, inside of each circle. Finally, it all worked pretty well. In comparing the accuracy of prediction to star catalog data, I found the right ascension was within an error of at most 2 arc seconds and the declination error was less than 2 arc minutes. The AIP4WIN textbook says that error of less than 1 arc second are possible with amateur equipment for focal lengths greater than 200 mm. My scope, with 950 mm, or any scope in general, should be just fine, and accuracies of better than 1 arc second are possible. I still find it really amazing that I can point my camera up at some location in the sky and then by using the star catalog and software be able to measure location on the celestial sphere down to the arc second. Pretty neat. Of course, all of this relies on all the hard work or earlier astronomers.